I’ve previously written about some of the challenges posed by my frequent work travel. Ever since I left New York City for Spain in 2010, travel has been a crucial aspect of my job function across my last two jobs. That said, I’m pleased to announce that today is my last day at my current employer and I’m starting a new job next week. I’m very excited about the opportunity – I’ll be working for a large, well-known software company based in San Francisco that’s known for their work-life balance and low employee turnover. In fact, they’re ranked in the top 10 in Fortune’s Top 100 Best Companies to Work for 2014. At the finish line of my current job! The interview process was difficult – it spanned the past 5 months, consisted of 7 interviews, and certainly had me on edge until the offer was extended; it undoubtedly made me feel anxious at times. Now, I’m very pleased to lift the lid on my career switch and what it means for Taylor and I. My days on the road have officially come to an end – I’m no longer expected to travel for work, and the extent of my “travel” would be customer visits in San Francisco or an occasional workday in a satellite office down by San Jose. There are ample opportunities for advancement, and I’ve heard nothing but great things about the company itself – it’s a huge milestone in both my personal and professional lives. All that said, I now have a great opportunity to train consistently without some of the obstacles that have hindered my recent training cycles. 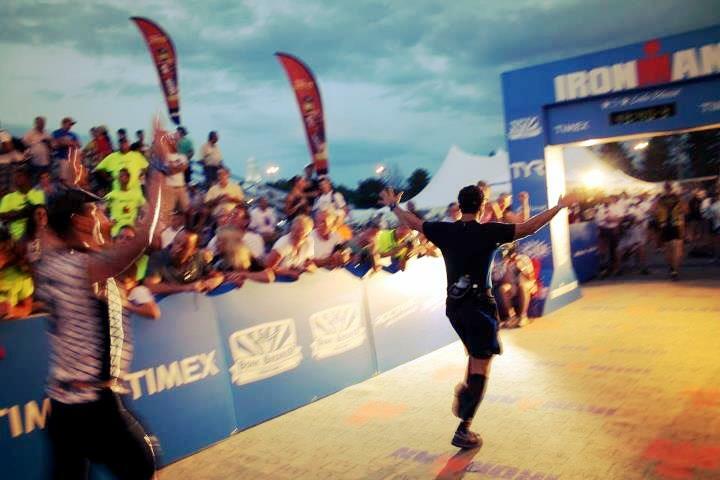 I really couldn’t be much happier about the move – unless I break 12 hours at Ironman Lake Tahoe in September! Stay tuned! Congratulations; that’s so exciting! When we moved to San Diego, I quit a corporate job with a lot of travel, and I haven’t regretted it one bit! Definitely more time to train, and we get to spend so much more time together. I hope the new career move is a wonderful experience! Thanks so much for the kind words! It’s great to hear that you were in the same boat and haven’t looked back – we are very excited about the move and what the future has in store! Congrats brother, do your new company proud and enjoy that new balance. I am asked to travel on a regular basis and I just won’t do it anymore. Awesome!! Congrats!! Super exciting!! I am sure a more consistent training cycle will get you that sub 12 in Tahoe!!! Congratulations, sounds like this is exactly what you need! Must feel so nice to get out of a situation that was no longer working for you, and know that you’ve found something that suits your needs so much better. Good for you. Having a work life balance is so important. That is often so overlooked. Good luck in your new job. Congrats on the new job – best of luck! What a great feeling. I need to start looking for other opportunities. Congratulations!